As the Wrath of the Lich King heads towards a close, more and more people are looking towards PvP to provide them with entertainment. There is no hard and fast way to play a healing Priest in the various battlegrounds, however here are my hints and tips for keeping yourself out of the Graveyard. Equip your best PvP gear. Stamina and resilience are king here, there is no point worrying about throughput and regen when you have 18k health. Make sure every thing is enchanted and gemmed. Pay a visit to the reagent vendor. You want at least 40 candles for a couple of hours PvP. More is obviously better. Every time you resurrect, it’s likely other people will be ressing along side you and using the group buffs makes better use of the zero mana cost period directly after resurrection. Pick up drinks. You can’t guarantee the presence of a mage and even if one is present, quite often they won’t make tables/hand out drinks anyway. If you use Grid to heal, add Unstable Affliction as a debuff in it’s own right and set it’s priority to 99. You want it to sit above all other magic debuffs. You might want to consider adding Weakened Soul as well as debuff too, that way when there are lots of other Priests running around you don’t waste time trying to shield a weakened target. If you are queuing up solo, check out your team mates. Find a suitable looking Dpser to heal. Obviously it’s impossible to figure out the “best” player but things to consider are class, gear, spec. Buff the team with fortitude, divine spirit and shadow protection. This is best done towards the end of the preparation period to make sure you get all of your team. Point this out to any and all people demanding to buffed when you only have half a team. Pick up any healthstones and food/drink on offer. Make sure they are shortcutted on your interface. In the last few seconds of the preparation period, buff yourself with Fearward and Innerfire. Shift M brings up a small version of the battleground map which can sit happily on your main interface, allowing you to see stuff like your team distribution at nodes and where the enemy flag is in WSG without having to flip between map and your normal view. Try not to arrive at a confrontation point first. You want a couple of people ahead of you to draw the enemy fire. Keep up Innerfire at all times and make sure you use Fearward whenever it’s off cooldown. Be careful with your shadowfiend. If you need to use him in a conflict involving enemy healers, it’s best to set him on the healers because healing aggro will draw him there anyway. That way you don’t lose any regen time whilst he hits the guy you set him on once and then decides to bounce over to the healer in the corner. If you’re setting him on another Priest, try to either make sure their fear is on cooldown first or use your fearward on your shadowfiend. In a 1 v 1, use your shadowfiend as a dps boost even if you don’t need the mana. They pack quite a punch. Shackle can be used as CC on gargoyles and ghouls. As well as annoying Death Knights, this can help buy yourself or your teammates some breathing room. If you haven’t died much and you need to get back into the action fast, you don’t have to wait for the Angel to res you. Pop back to your corpse, hoping no enemies loot it in the process and take a manual res. Sometimes this can be the difference between winning and losing a node. Use Divine Hymn. Pick your moment, aiming for one when no one is focusing you but when multiple people are taking damage this is amazing. Learn to love Desperate Prayer, spec for it and use it. Ideally keybind it. Binding heal is amazing too, whenever you need to heal yourself in group combat and you’re heading towards the Flash Heal key, go for binding heal. Use enemy V bars to see the health of all your enemies engaged in a particular battle. Sometimes throwing a shadow word death or a dot out makes all the difference. Just because we are healers doesn’t mean we can’t be aggressive. Manaburn, especially when combined with power infusion can be deadly. Consider it against caster dps as well as other healers. Keep moving. When fighting casters in particular run through them and around them to try and stop them hitting you. Stop only when you need to. These days AV is the only battleground containing less PvP than the average capital city so there isn’t much you can do here. Stick with the group and heal whoever is tanking Drek’thar or Vandar. If you’re defending a tower/bunker, cast fortitude on the archers. Every little helps. You can also shield them now they took the group requirements away from power word shield. Mind control can also be used to buy you crucial seconds when attempting to flag a tower/bunker. Throw them out and in the time it takes for them to run back, you should have it safely tagged up. The same strategy also works whilst defending, throw the attackers out to give yourself time to take it back. Sometimes even as a healer you’ll end up defending a node solo. Make sure you have a decent vantage point over the node and keep your eyes on the flag. If you see anyone coming, ask for help and be vocal. Personally I like the Lumber Mill because it gives a good view of the Farm, Stables and Blacksmith. You can mindcontrol people off the cliff at the Lumbermill but watch out for Elemental Shamans, Fire Mages and Boomkins looking to return the favour, as well as enemy priests. If you’re fighting any of these classes you might want to pull the fight away from the cliff edge. From the LM if you need to get the Blacksmith in a hurry, jump off the cliff on your mount and cast levitate asap. Make sure levitate is short cutted and easy reach otherwise you get to the Blacksmith graveyard rather than the flag. All the different nodes come with some terrain advantages, use them. The buildings can provide LoS for fighting casters, figure out the best places to run to, making sure you keep your eyes on the flag at all times. Mind control can be a winner here as well. You can throw people off the centre but again like Arathi and the Lumber mill, you need to look out for classes with throws. Never put your back towards an edge. 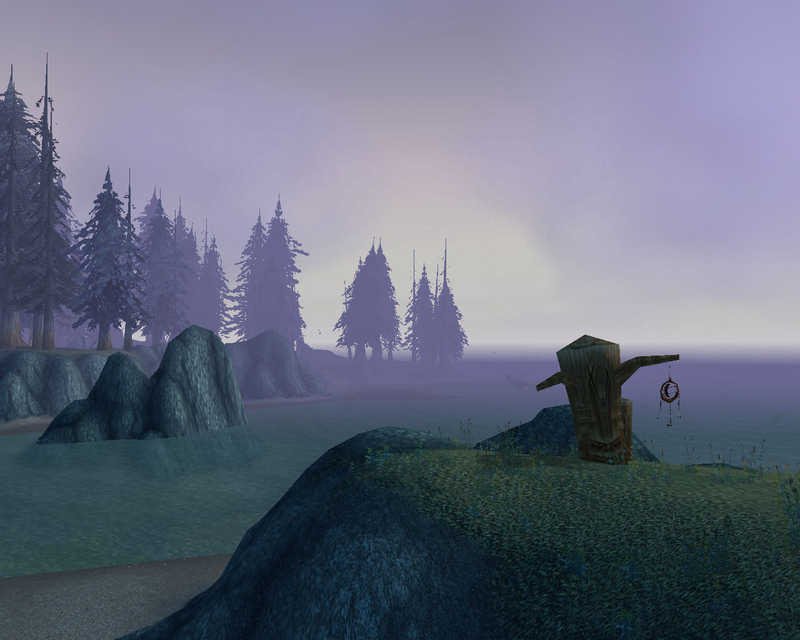 The main PvP takes place at the start of this battleground. Stick with your team and go where the majority do. If you control the Hangar, consider levitating away to the Workshop and seeing if you can steal it whilst the enemy aren’t looking. Dot enemy vehicles, especially dangerous ones like glaives which have minimal health. When attacking, grab a ride on a vehicle. You can heal your teammates on the ground perfectly safely from up here. To protect the vehicle use mindcontrol (You can’t move controlled players but it’s great for letting the vehicle run away from melee held stationary by your mindcontrol). In between mindcontrol fun, use fear. From the back of the vehicle your fear will hit melee on the vehicle. Magic dots are dispellable and whilst you can’t heal the vehicles you can reduce the damage they take. When riding on a vehicle and being in no immediate danger, dispell unstable affliction. Keeping all the dots off the vehicle is more important than taking a bit of damage yourself. When defending, utilise the transporter pads to escape. Healing from the platforms can be great when both sides are fighting underneath a gate. Vehicles are key, make sure you keep dots on them as a bare minimum. Shadowfiends should also be deployed on them. Keep the flag carrier alive. Whilst Disc priests can flag carry easily it makes more sense to play as support. Even though you don’t have the flag you’ll probably ending up tanking much if not all of the enemy team. Mind vision can be used to track enemy flag carriers if you aren’t sure exactly where they are. The map shows you their position but you can’t see which level of their base for example they are on, neither does the map show how much support they have. Mind vision can show you all that. I said “healing priests” at the start for a reason. Now I know Discipline is considered the PvP spec for a reason but I do think Holy can play it’s part well in the bigger battlegrounds. In WSG, Arathi, EoTS and Strand of the Ancients, it’s group healing potential is unnecessary and Disc always wins out, but in Alterac Valley and Isle of Conquest being able to heal large numbers of people at once can win games. However that said, I prefer to PvP as Discipline. The extra survivability, especially when undergeared can make a huge difference. Knowing the enemy is key. Learn as many of the other classes abilities as possible and recognise them being cast. For example take a feral Druid’s berserk. This ability not only makes you immune to fear and allows you break fear when cast but it decreases the energy cost of kitty abilities. When it’s up A.you don’t want a druid behind you spamming shred so try and keep moving and B. it’s a great time to use pain suppression. In order to correctly counter moves, you first have to understand them. What happens come Cataclysm when someone shoots a Worgen with a Rowan’s rifle of silver bullets? I mean precedent has already been set. The Worgen in Grizzly Hills are “allergic” to wolfsbane and when threatened with silver bullets they panic. Hopefully, they will be looking at least a thirty minute res timer but surely it would be more “realistic” if their character got deleted. I’m not a great fan of the Worgen. The blame lies entirely at the doors of those elite Sons of Arugal roaming Silverpine Forest, but even ignoring that it smacks a little of laziness. Gather close little children, come hug the fire and listen to my tale of woe. Watch the flames closely. See them twist and leap and turn, stare into the glowing embers and let your mind go blank. Listen, listen. Can you hear the church bells pealing joyfully? From out of the darkness figures start to emerge, buildings swim into being from the mist. Our story begins many years ago at Stromgarde in the Arathi Highlands. It’s springtime and cart after cart is crossing the drawbridge into the keep. They’re loaded with flowers, piled high with liferoot, mageroyal, peacebloom and black lotus. Tendrils of grave moss and cascades of dreaming glory flow over the deep red paintwork of the wagons. Within the fortress walls, banners are being hung and every nook, cranny and available wall is being draped in vibrant blooms. Footmen in their scarlet livery carry overloaded plates towards the garden where a huge tent is being build. Every little thing has to be perfect when the Prince marries today. Within the cold stone walls of the Keep itself, the bride to be leans her head against the wall and sobs softly. The chiming of the chapel bells seems to signal her doom. It’s as if they are playing the passing bell and not the wedding march. Checking her reflection one final time in the looking glass, she sighs. From her tiara of night dragons breath and white roses to her crystal slippers she looked every inch a Bride suitable for a Prince of Arathor. A maid hands her the bouquet, creamy peacebloom, white roses and a scarlet splash of firebloom. All the waiting women smile and tell her how beautiful she looks but all the Bride sees is fresh red blood on white linen bandages. Leaving the bed chamber, her eyes flicked back and forth. Down the long echoing corridors, past women in brightly coloured gowns and Knights with their dark red tabards. No one speaks to her, they just smile emptily as she is pulled past them. Out of the Keep now, down into the walled gardens. Through the shrubbery and under the arches of roses, towards the old Chapel. The pealing of the bells mocks her, like a child giggling just out of reach. Inside, away from the bright sunlight, it’s dark and forbidding. After the ceremony, feeling dizzy, she rushed to the garden. Finding a quiet spot, away from all the backslapping and congratulations to sit and dream. To dream of a man. Not the one she married, not the one in the deep red clothes with the sword at his hip. Oh no, not him. The nebulous figure which filled her dreams was that of a gardener’s boy. Quiet, humble and kind, no songs would ever be written about his prowess in battle. He would never march at the head of an army bringing death and destruction along in his wake. Instead, flowers would carpet where he trod and birds sing over head. It was there, sitting in the garden, twisting her heavy gold ring that manacled her finger, that he found her. The gardener’s boy, come to Stromgarde to help organise the thousands of blossoms brought in from the countryside. Side by side they sat, the Bride and her boy talking of love and escape and happiness over the sea. It was near dusk when he found them, the Prince of Arathor with his sword girded on. The hand of his Bride clutched to another man’s breast. By the time his men reached them, the gardener’s boy was already dead. His rich red blood a stain on the Bride’s white dress. Ignoring them, he dragged his Bride up to the Keep, past guest and guard alike. Sword drawn, blade dripping red, he marched her through corridors and passageways, past tapestries and paintings. Always upward, staircase after staircase until they could almost touch the stars. The Bride of Arathor she vanished that night. No body was ever found but they say if you wander the highlands late at night, when the full moon hangs low in the sky and the liferoot blooms, you’ll see her. That long white dress is black with dirt and blood. Her torn and tattered veil covers her face and the ghost of a rose holds it in place. She walks the lanes and searches the gardens, looking all the while for her long dead gardener’s boy. Where her broken crystal slippers touch the earth, you can still smell the flowers, the peacebloom, roses, dreaming glory and mageroyal that blossomed all those years ago. As long as there is a son of Arathor left to raise that standard high, she’ll wander their lands searching for her stolen love. So next time you saunter home late, beware the subtle scent of roses drifting on the air. This story was inspired by a childhood spent reading ghost stories and by the Arathi Basin Battlemaster, the Black Bride herself. What her story really is, I’ve no idea but I love the name and decided to write her one myself. 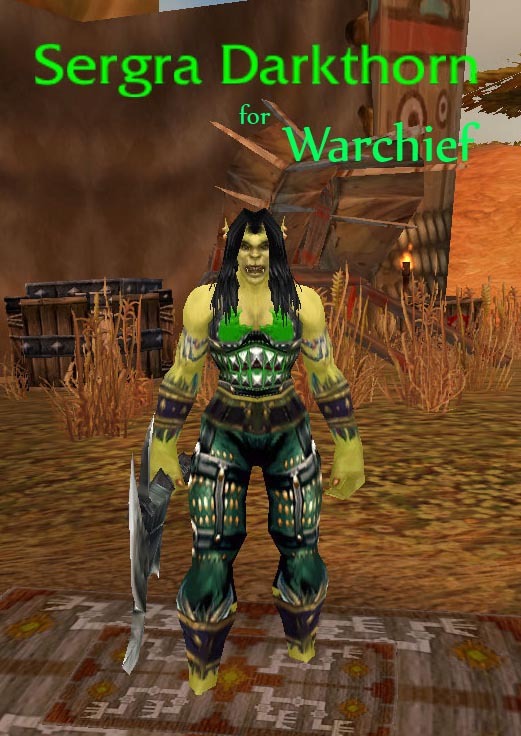 If we are going to see a shake up in the Horde leadership come Cataclysm, my vote for Warchief goes to …. It’s time the Daughters of the Horde took control. This week’s shared topic comes courtesy of Nexdominus. What are you doing if anything to get ready for cataclysm? My pre-cataclysm plans are fairly simple. My main focus is on the things which are likely to be changing when the expansion hits. Completing Loremaster on Erinys (not many quests left now) and maybe just maybe trying to complete it on Tansy too (although that might be taking masochism a tad too far). Explorer on as many characters as I can be bothered dragging around Azeroth. Complete all the Classic dungeons on at least my Priest and Druid just in case any change with Cataclysm. Finish collecting my dungeon set one gear on both the Priest and Druid, then complete the quest chain to upgrade them. Finish the Doomguard summoning quest on Teasel. We know the Blasted Lands will be changed some what, so I want to finish this just in case the quest giver gets a Worgen farmstead dropped on top of him. Besides those I want to collect as much gold as possible so I can afford all those gold sinks Blizzard like adding. Being able to upgrade all mounts to 310%, money for any Cataclysm versions of the Traveller’s Tundra Mammoth, that sort of thing. In tandem with this, I’m working on clearing out all the junk in my bags across all characters. Unfortunately I’m such a hoarder and things like old PvP sets which aren’t sellable tend to sneak past my radar, hogging bag space for months. I’m not 100 percent about which character/s will be my main/s in the next expansion, so I need to level my shaman to 80 as well. She’s currently enhancement and lv 72 sitting in the Howling Fjord, but I’m tempted towards speccing elemental/resto and hitting Alterac Valley. Seeing how many Horde I can throw off the bridge at Dun Baldar could be considerably more fun than repeating quests again. Finally I’m thinking about the two remaining character slots I have on the server I call home. Current thinking is drifting towards a Nightelf mage and either a Worgen shadowpriest or rogue, although Gnome shadowpriest is exceedingly tempting too. So I’m working on finishing up my heirloom collection as well as trying to think of possible names for them. In general though, I’m not too worried about preparing for the expansion. I’ve never been prepared before and things have always worked out ok.
What if anything are you doing to prepare for this cataclysmic time? It’s ridiculously hot here at the moment, real ice cream and paddling pool weather. Which means it’s far too hot to be indoors writing sensible blog posts, instead here are a couple of pictures of random things. 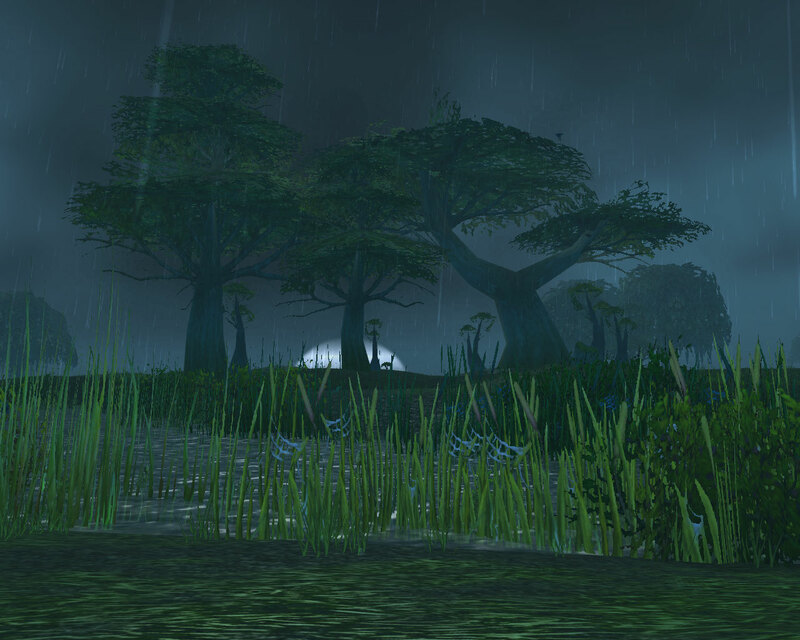 The marshes in a thunderstorm. 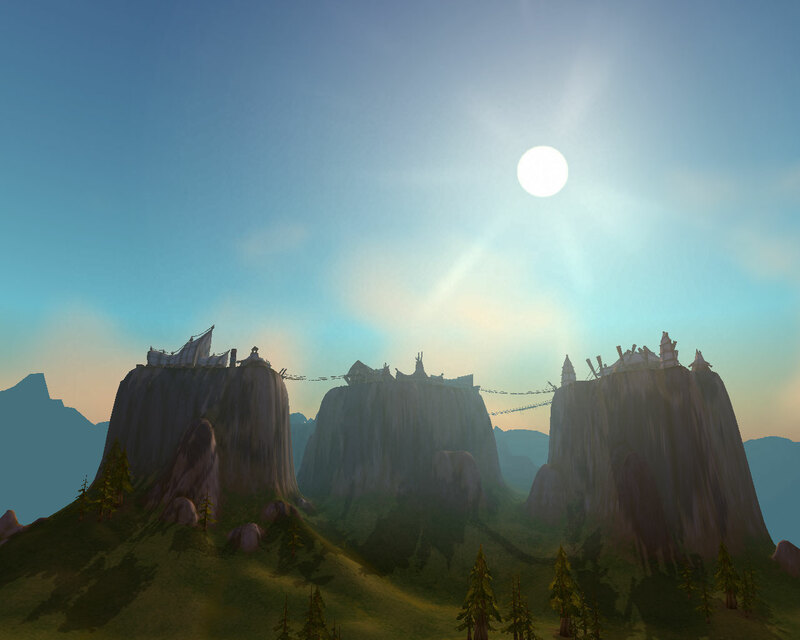 Thunderbluff as seen from the slowest Zeppelin in existence. Finally the cool purple haven which is Azuremyst Isle. I could just dive into those waters right about now. A couple of things occurred to me. First of all, Lady RNG hates me and secondly why exactly am I attempting to get a dragonhawk on my Priest when she only rides two mounts even though she already has seventy plus. Apart from “Spike” the Ironbound Protodrake and her ethereal swift moonsaber, none of her other mounts ever gets taken for a ride. I fell in love with the beautiful blue butterfly the day I first walked into the Sunwell on the test realm. My heart broke when I discovered hunters couldn’t tame them. The day Blizzard announced they were making one the reward for having 100 mounts I knew I had to farm one. So I need to find another 27 mounts from somewhere. Having read and re-read Birdfall’s awesome guide to 100 mounts solo, I’ve come up with these as possible contenders for my missing ones. Sea Turtle – need to start fishing again. Quel’dorai Steed – something inappropriate about Erinys riding a unicorn… However I’m so far off in terms of seals it may never be a problem. Need to break out the jousting again, eek. (100 seals). Stormwind Steed – more jousting (100 seals). 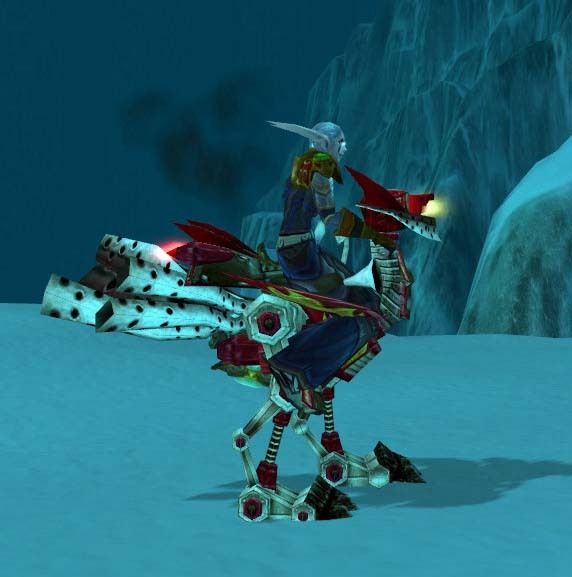 Deathcharger’s reins – The Baron and I are intimately acquainted but as of yet, no mount. I think I blew all my RNG mount luck when I got the Polar bear from the first daily I did for those lovely blue ladies in the Storm Peaks. Winterspring Frost Saber – I’ve been farming this since the summer of 05, so I really don’t rate my chances on this particular front. Swift Zulian Tiger – see all other RNG related mounts and weep. I have two and a half characters exalted with the Zandalar trolls and I’ve never seen either of the mounts drop. Darnassian NightSaber – Yet more jousting (100 seals). Exodar Elekk – (100 seals). The Raven Lord – Between us, my boyfriend and I have three druids on our server which can summon Anzu but so far he just keeps giving me a rubbishy gun. Swift White Hawkstrider – Kael hates me. At least we’ve discovered if you pull him whilst one or more of the trash pack in his room is still alive you don’t have to listen to his pre-attack speech. Unfortunately there seems to be no way of skipping his overacted death scene. “The Master will have you! You will drown in your own blood! The world shall burn! Aaaghh!” – Although he may be right about that last bit. Gnomeregan Mechanostrider – the only thing which looks stupider than a female nightelf on one of these is a male nightelf, oh and male draenei but then they don’t look great on anything. Azure Nether Drake – I never bothered farming the Netherdrakes before because I wasn’t taken by the way they looked, that whole jelly look. Haribo could make a “Netherdrake” line to sit besides their “Starmix” bags. Violet Prot0-Drake – I’m two holidays away from this. Wyrmrest red dragon – I’m already exalted, I just haven’t picked up the mount yet. I’m waiting until I’m a bit closer to my total. Culling of Stratholme Dragon – Yes, I know. I keep thinking I must be the only person not to have this mount but every time I run Strat, I lose the roll..
Motorcycle – I’m waiting until my Druid can make this which should hopefully be fairly soon. The heroic badge one – I’m currently a bit low on badges having bought pretty much all the heirloom gear for various alts, but I’m working on building my total back up. The expensive one from the Sons of Hodir – I’m exalted and have the gold so can pick this one up whenever. Will probably wait until I’m a little closer with the rest though. The final ones will probably come from doing a spot more jousting/Tournament related dailys. If my maths is correct, there are 10 potential mounts that I can still grab through jousting, only 4 of which actually made the list so I have plenty of leeway should Lady Luck continue to hate on me. Although I’m also killing Attumen every week in the vague hope that he’ll drop a fiery warhorse. Having three character’s exalted with the Violet Eye and never having see one though, I can’t say I’m particularly optimistic though. However I want it done before Cataclysm ships and makes it easier. Basically all it comes down to is time, time and lots and lots of jousting. One of great things to come out of this mount farming however is I’ve discovered just how much fun the Netherwing dailies actually are. The Booterang quest is amazing, I wish we could throw them at players. Someone is slacking in a raid, a booterang to the face will wake them up. Then there is the races to become “Top Orc”, I wish they were repeatable quests because I had such fun doing them. Skyshatter provided a challenge and when I vanquished him, I felt a real sense of accomplishment. On the downside, I still haven’t learnt to love jousting. It’s not that I can’t do it, it just annoys me on some level I can’t quite understand. Vehicle stuff doesn’t normally bother me half as much as the jousting does, for example I like fighting on the back of dragons and even Flame Leviathan but jousting leaves me cold.